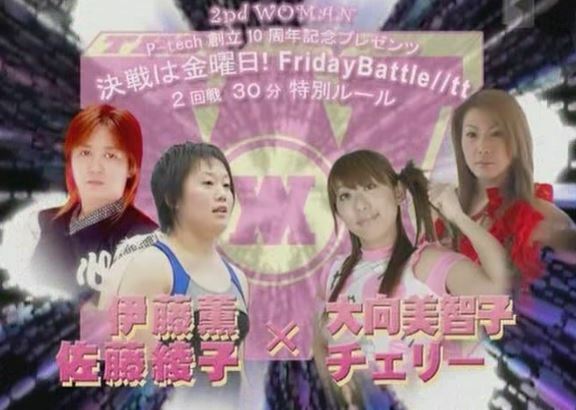 This show has the conclusion of the Friday Battle Tag Tournament, some of the early matches in the tournament can be found in my last review of the promotion. Just to remind everyone, I don’t understand the rules of the tournament matches. The matches are clipped and each match was won in a different time with a different number of falls. Because the matches are clipped I can’t figure out when points are given as sometimes it isn’t shown. So I am just going to call the matches as they happen which is all I can do. To reach the second round, Sakura and Ichii defeated AKINO and Ayumi Kurihara on April 7th, I have no idea what GAMI did to earn her place but since her partner was “X” coming into the show I am guessing it was an automatic bye of some sort. Sakura was a Freelancer in 2006, while Ichii was one of her trainees. GAMI was one of the backstage leaders of THE WOMAN and a regular on all the shows, while Ran Yu-Yu was a Freelancer as she never officially joined a new promotion after GAEA closed in 2005. GAMI and Sakura start off, Sakura goes for a few quick pins but GAMI reverses one and picks up a pinfall for her team! GAMI and Yu-Yu are up 1-0. Sakura isn’t happy and clubs GAMI, armdrags by Sakura and she applies La Magistral for the three count! The teams are tied 1-1. Sakura tags in the very excited Ichii, she rolls up GAMI but GAMI kicks out. Crossbody out of the corner by Ichii but GAMI comes back with a lariat. Ichii dumps GAMI out of the ring, she runs to the corner and hits a triple jump plancha down to the floor. We jump ahead to Sakura and GAMI being in the ring, and GAMI is double teamed. GAMI comes back with a boot to the face and a STO before tagging in Yu-Yu, Yu-Yu goes up top but she only fakes attacking Sakura so that GAMI can hit a German suplex. GAMI hits both her opponents with her horn, knee by Yu-Yu to Sakura and she covers her for a two count. Sakura DDTs Yu-Yu and rams her head into the mat, GAMI tries to hit Sakura but she hits Yu-Yu by accident. Sakura slams Yu-Yu and tags in Ichii, dropkicks by Ichii but Yu-Yu kicks out of the pin. Yu-Yu knees Ichii and dropkicks her, Ichii fights back with elbows but Yu-Yu hits a high kick. Dropkick by Ichii and she hits a trio of jumping kicks, but Yu-Yu barely kicks out of the pin. Ichii picks up Yu-Yu but Yu-Yu ducks the kick, Sakura runs in but GAMI takes care of her. They try to double team Ichii but it backfires, Sakura dives out of the ring onto GAMI while Ichii hits the Triangle Kick on Yu-Yu. Victory roll by Ichii, but it gets a two count. Running knee by Yu-Yu, but Sakura breaks up the cover. Yu-Yu picks up Ichii and plants her with a cutter, but Ichii won’t stay down for the count. Ichii high kicks Yu-Yu repeatedly, she rolls up Yu-Yu but Yu-Yu kicks out. Running elbow smash by Yu-Yu, and she picks up the three count! GAMI and Ran Yu-Yu are the winners and reach the finals of the tournament. Even though they are calling it “Round 2” it is really the Semi-Final since it was only an eight team tournament. Ito and Sato defeated the power team of Toyota and Taiyo to reach the Semi-Finals while Omukai and Cherry defeated Aja Kong and Hamada. All four were technically Freelancers at the time, which isn’t surprising since aside from GAMI there weren’t really any contracted wrestlers for THE WOMAN. Both teams scored upsets in the first round, so whomever reaches the final will likely be the underdog as each team has a weak link. Sato and Cherry start as the legal wrestlers, quick dropkicks by Sato and she slams Cherry to the mat for a two count. Cherry comes back with her own dropkick but she eats another dropkick for her trouble, they trade elbows until Sato knocks Cherry to the mat with one. Sato goes up top and hits a missile dropkick, she goes up top again as Ito comes in the ring and hits a second missile dropkick for two. Sato tags in Ito, Cherry tries to slam her but Ito is having none of that and hits a scoop slam followed by a footstomp and an elbow drop for a two count cover. Omukai comes in and attacks Ito from behind but Ito lariats both of them, and she covers Cherry for a three count! Ito and Sato are up 1-0. We clip ahead a bit as Cherry hits a missile dropkick, but Ito roars back with a lariat. Powerbomb by Ito, and she gets a three count pinfall! Ito and Sato are up 2-0. Sato comes back in but Omukai kicks her from the apron, giving Cherry time to tag in Omukai. Knee by Omukai but Sato dropkicks her, she goes up top and tries to missile dropkick Omukai but hits Ito by accident. Omukai tags in Cherry, airplane spin by Sato to Cherry but Cherry avoids It’s diving footstomp. Omukai comes in but she kicks Cherry by accident, Sato picks up Cherry but Ito accidentally lariats Sato. German suplex hold by Cherry to Sato, but Ito breaks up the cover. Northern Lights Suplex by Cherry, but Ito breaks it up again. Cherry gets on the top turnbuckle and hit the Cherry Bomb, cover by Cherry and she gets the three count! Cherry and Omukai somehow win 5-2 and advance to the finals. I really wish I understood their points system, that would be nice. This was another fun match, I liked Omukai letting the less experienced Cherry do most of the work and only coming in to help when needed. Similar on the other side, the veterans were letting their partners do the bulk of the work which seems logical, I’d do the same thing. For a newer wrestler, Cherry looked good here as she didn’t mess up anything, and the action was solid. Too short (about six minutes) to recommend but not a bad match to watch. The Internet told me that Sarubobo Mask is Kaori Yoneyama, the body type seems wrong but I’ll have to roll with that. Policewoman was Yuki Miyazaki, who recently made her return to wrestling and is frequently found in Pro Wrestling WAVE. No real storyline that I am aware of, just two comedy-esque wrestlers putting on a show. Sarubobo Mask pushes Policewoman into the ropes as the match starts but Policewoman applies a Cobra Twist which is reversed by Sarubobo Mask. Sarubobo Mask jumps up into the corner but Policewoman hits repeated Oil Checks, she tries to shoulderblock Sarubobo Mask off the apron but Sarubobo Mask avoids her charge and hits a sunset flip for two. Elbows by Sarubobo Mask and she hits a German suplex hold, but Policewoman gets a shoulder up. Sarubobo Mask goes up top but Policewoman gets her knees up on the diving body press attempt, Policewoman rolls to the floor to get a plastic bin and she hits a DDT onto it for a two count cover. Policewoman hits a release German suplex of her own, she goes up top but Sarubobo Mask avoids the moonsault goes for a few flash pins with no luck. Policewoman picks up Sarubobo Mask and hits a Samoan Driver, La Magistral by Policewoman and she gets the three count! Policewoman wins the match. A short match that was slightly clipped further. These types of matches don’t do much for me, it wasn’t comedic enough to be a comedy match but neither were putting a lot of effort into putting on a cohesive and entertaining match. Both wrestlers are much better when they aren’t wrestling under a mask. Midcard filler at best, but definitely skippable. It is Super Baby Becky Lynch! I think this is the first televised appearance by Lynch in Japan, course back then she was going by the name Rebecca Knox. She was only 19 years old at the time of the match, wrestling in a different promotion but still looking pretty comfortable with it. Bullfighter Sora is a mostly comedic gimmick played by Atsuko Emoto, while Kyoko was a Freelancer who wrestled in a variety of different styles of matches. Yuri Urai had a very short career, as she debuted just two months before this show but retired in 2008 after becoming a regular in Guts World. I don’t have high hopes for the match but it will be fun to see a young Becky Lynch wrestling anyway. Sora and Knox are the first two in, Knox gets the early advantage but Sora rams her with her horns. Kyoko comes in and they hit a double atomic drop before both spank Knox until Urai comes in. She gets the same treatment, we clip ahead and Kyoko is in the ring with Knox. Knox avoids a headbutt and hits a headscissors, dropkick by Knox and she hits a monkey flip out of the corner. Kyoko rolls Knox to the mat and applies a Kimura, she gets to the ropes and hits a release fisherman suplex for a two count. Knox tags in Urai, Urai goes for a crossbody but Kyoko catches her. She tries again with the same luck, hard elbow by Kyoko but Urai keeps getting back up. Urai finally stays down and Kyoko tags in Sora, Sora charges Urai but Urai blocks her charge and hits a pair of dropkicks. Sora rams Urai and they take turns with strikes, Kyoko holds Urai but Sora hits Kyoko by accident. Shoulderblocks by Sora, she tags in Knox and Knox comes in with a diving crossbody. Fisherman suplex hold by Knox, but Sora gets a shoulder up. Knox picks up Sora but Sora gets into the ropes, backdrop suplex by Sora and she covers Knox for two. Kyoko comes in and they hit a double vertical suplex on Knox, Sora picks up Knox but Knox gets away and hits a hurricanrana. Kyoko runs in but Knox flips Sora over so that Kyoko kicks Sora by accident, Knox then flips Sora back so her shoulders are on the mat and she picks up the three count! Rebecca Knox and Yuri Urai win! You can tell how low Sora was on the pecking order when she loses to a rookie and an unknown 19 year old gaijin. There were a few cute spots here and it was overall a well done match, considering the wrestlers lack of familiarity with each other. It was fun seeing Lynch so early in her career, she was too young to be able to say “she’ll be champion one day!” but generally everything she did looked crisp. A short match but not a bad one. And we have reached the finals of the tournament! Both of these teams wrestled earlier this evening, Omukai may be the best wrestler of the bunch but Cherry is the least experienced so it is anyone’s game. The winner doesn’t get anything really, aside from bragging rights and a bit of extra cash to take home. Yu-Yu immediately hits a German suplex hold and then La Magistral on Cherry, but both covers get a two count. Enzuigiri by Yu-Yu, she picks up Cherry but Cherry sneaks in a schoolboy which GAMI breaks up. GAMI and Cherry go at it as the legal wrestlers but Omukai comes in and kicks GAMI, double lariat to GAMI and Cherry tags in Omukai. Yu-Yu come in too but Omukai throws her down by the hair, she then grabs GAMI and slams her face-first into the mat. Cherry returns, Yu-Yu boots Cherry in the face and GAMI does as well. GAMI tags in Yu-Yu, kicks by Yu-Yu to Cherry and GAMI gets her shots in on Cherry as well. Omukai trips Yu-Yu and GAMI from ringside, she pulls them out of the ring as Cherry goes up top and hits a diving plancha onto both of them. Cherry and Yu-Yu return to the ring as does GAMI, Yu-Yu elbows GAMI by accident and Cherry hits a face crusher onto Yu-Yu. Omukai is tagged in, she boots Yu-Yu and then hits a double lariat on both of her opponents. GAMI grabs Omukai’s arm and walks the ropes before applying a hanging armbar. She releases it after a moment, lariat by GAMI and she tags in Yu-Yu. Yu-Yu knees Omukai in the stomach but Omukai elbows her off, package German by Yu-Yu but Omukai kicks out. Yu-Yu goes up top but Omukai avoids the diving kneedrop, spinning heel kick by Omukai and she covers Yu-Yu for two. Heel Drop by Omukai, but again Yu-Yu gets a shoulder up. Omukai tags in Cherry, missile dropkick by Cherry and she hits two more, getting a two count cover. Yu-Yu elbows Cherry away, Omukai tries to help but Cherry elbows her by accident. Yu-Yu puts Cherry on the second turnbuckle but Cherry kicks her and hits a tornado DDT. GAMI hits Cherry with her horn, Yu-Yu tags in GAMI and GAMI goes for the pump-handle slam, but Cherry slides away. Yu-Yu comes in and kicks Cherry in the head, German suplex hold by GAMI but Omukai breaks it up. GAMI goes up top but Cherry avoids her dive, Cherry goes for a bodyscissors roll-up but GAMI blocks it and applies an armtrap crossface. Cherry gets into the ropes, GAMI puts Cherry on the second turnbuckle, Cherry goes for a tornado DDT but GAMI blocks it. Omukai grabs GAMI from behind and hits the Splash Mountain, Cherry Bomb by Cherry but Yu-Yu breaks up the cover. Cherry picks up GAMI but GAMI gets her back and with Yu-Yu’s help she hits a release German. GAMI and Cherry trade slaps, Cherry goes off the ropes but GAMI levels her with a lariat. Pump-handle sit-down slam by GAMI, but Cherry barely gets a shoulder up. Fisherman Buster by GAMI, but Omukai breaks up the cover. GAMI picks up Cherry but Cherry slides away and connects with a German suplex hold. Omukai boots GAMI, Yu-Yu fights off both Cherry and Omukai, she grabs Cherry but Omukai runs over and boots her in the face. Cherry elbows GAMI, then Omukai hits her with a Shining Wizard. Hurricanrana by Cherry to GAMI, and she picks up the three count! Omukai and Cherry win the match and the tournament! Like the last THE WOMAN show I reviewed, it is hard to put on a great show when it is condensed to one hour. The only real redeeming quality of the event was seeing Becky Lynch in her first televised match in Japan, as nothing else was overly memorable. The tag matches were fine, but either too short or just too meandering to really get invested into. Probably required viewing for the Becky Lynch completist but otherwise a show that doesn’t need to be sought out.